Research has revealed that on a world wild scale, over $10 Billion have been spent on open table dinners at restaurants, while over 250 million dinners have been held through open tables. 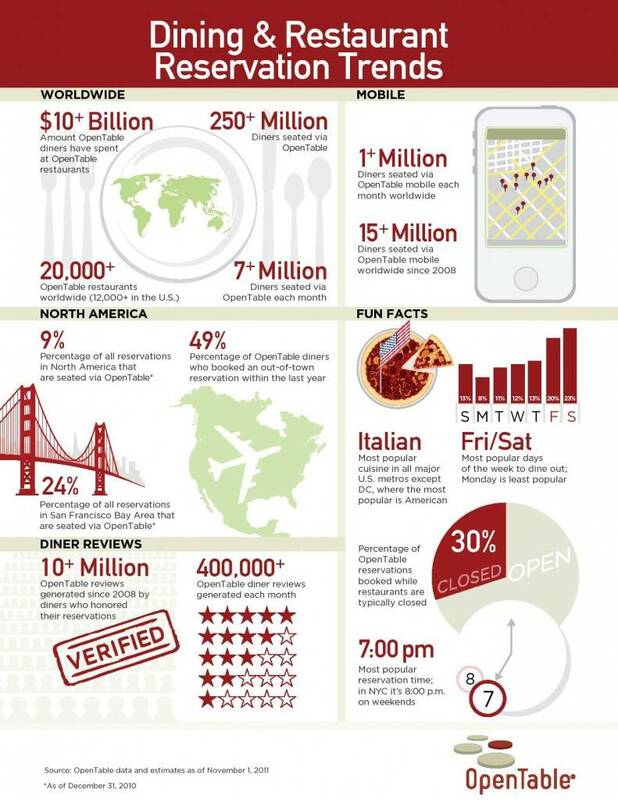 There are over 20,000 open table restaurants worldwide with over 12,000 in the US alone. Open Table Mobile have contributed to seating over a million open tables each month around the globe, in addition, since 2008, over 15 million dinners have been seated through Open Table Mobile worldwide. Of all reservations in North America, about 9% are seated through open tables while in San Francisco Bay Area, 24% of all reservations are seated through open tables. It has been verified that since 2008, over 10 million open table reviews were made by clients who honored their reservations, this is from an over 400,000 Open Table dinner review generated every month. Do you know that Italian cuisines are the most popular cuisines in all major US cities except the DC where American cuisines are most popular? The national average spent on dining out is $36.30. Interestingly enough, Millennials go out to eat more often than Gen X or Baby Boomers, according to the analysts. Do you also know that Fridays and Saturdays are the most popular days of the week for dining? While about 30% of dinner reservations are booked when restaurants are closed. Interestingly, 7pm is the most popular time chosen by clients in the city of New York while on weekends, 8pm is preferred.